So, you’ve decided to toss out your physical appointment book and make the switch to online scheduling — finally. We know it’s been a struggle to get the whole crew on board, change is never easy, but your clients will now have access to a whole new level of customer service. And you, well, you’ve just given yourself the gift of time. 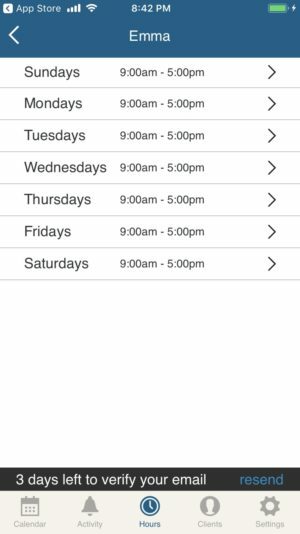 Let’s explore the steps your shop will take to get set up with BookedIN’s online scheduling app, so you can start booking those clients today. It’s time to download the BookedIN Mobile App to your phone or sign up for free on the website. You can find us by searching “BookedIN” on the Apple App Store or Google Play store. Once you’ve downloaded the BookedIN Mobile App to your phone, it’s time to open and launch. You’ll need to create a shop profile with necessary information and log in. Once you’ve completed those steps, have a look along the bottom of the app and select the Settings menu and meet me at Step Three. Are you following along on desktop? I got you. 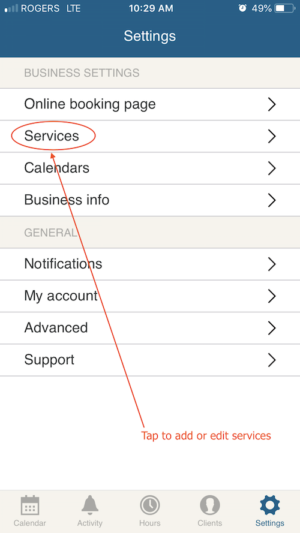 Head over to BookedIN and log in, once you’ve set up with the necessary details, look for Settings > Services in the top menu. Now you’re ready for Step Three. 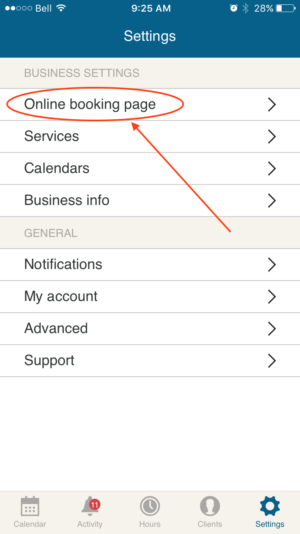 Once you’re inside the Settings Menu, it’s time to navigate to Services (under the Business Settings). 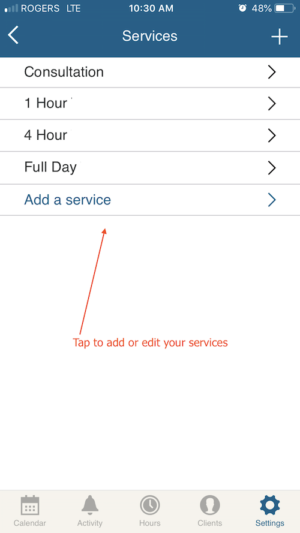 You can tap or select Services, and then quickly add information to your BookedIN Scheduling App. Side Note: In the future, this is the place to come if you need to Edit or change any of your services. If you’re following along on your desktop, it’s time to hit the Add New Service Button. This is also where you can find the Edit button. It’s located on the right-hand side of the service you’ve entered and can be used to modify any details. Now it’s time to complete your service information. You’re shooting for a compelling description here, use words that will grab your client’s attention. BookedIN recommends a detailed and complete profile, the more accurate information you’re providing to your clients the more impactful. ➡️ Service Settings: These settings allow you add services, pricing, descriptions, timeframes as well as payment options (there is a full breakdown of service setting definitions below). 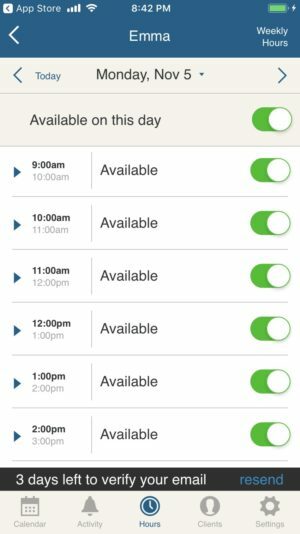 ➡️ Hours Settings: You’re able to set availability by day or week depending on personal preference. The last step is finalizing each of your service’s settings. On the edit screen, you’ll see a full set of settings that allow detailed customization which is outlined below. Once you get into the nitty-gritty of entering your services, it’s almost time to do your happy dance! 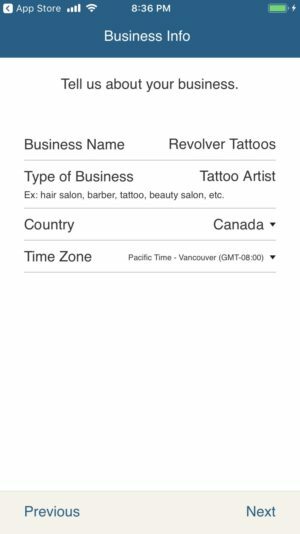 We’ll go through a quick breakdown to make sure your online scheduling app is optimized. Description (optional): This will show on your public online booking page. Here’s where you will talk about what’s included in your service, describing what it’s all about. Try to keep it to a few sentences. Category (optional): This helps to organize your services on your online booking page. Duration (required): Time options range from 5 minutes to 24 hours. Price (optional): This is required if you choose to collect online payments for your services. Make Public: Allows you to hide or display service on your public online booking page. Payment Options: This feature adds online payment processing to a service. 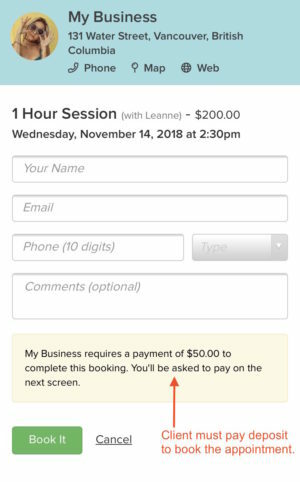 For a payment option, your client will see a green pay now button in three places: after your client books, in their confirmation email and their reminder email. Lead Time: You can choose the number of minutes. 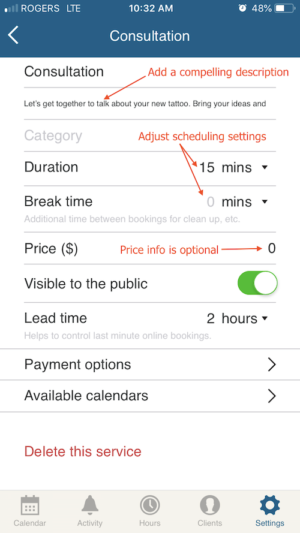 This setting is installed to prevent last minute bookings (ex. 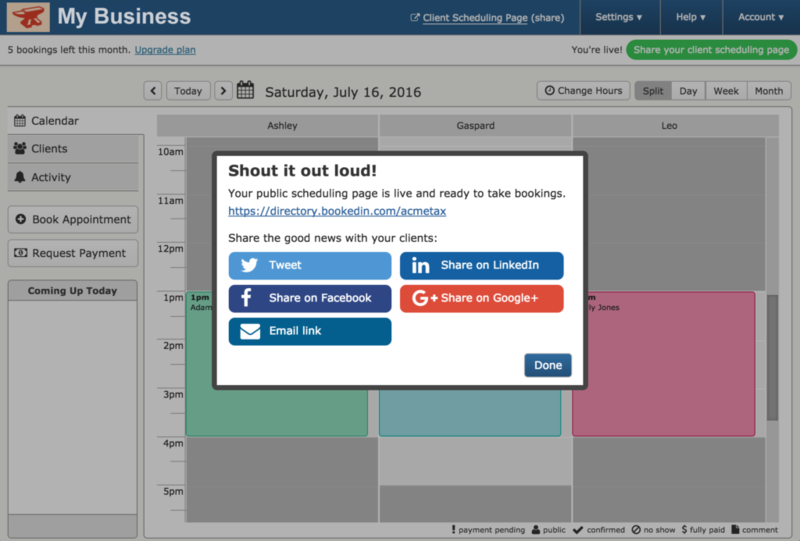 You need 1hr notice before booking, enter 60 min lead time). (a) Break Time (Optional): This feature is handy for clean up in between appointments, or preparing/set up. You can add any number of minutes to the service time. (b) Lead Time: The default setting is 60 minutes. Lead time can be set from “0” to your chosen timeframe. 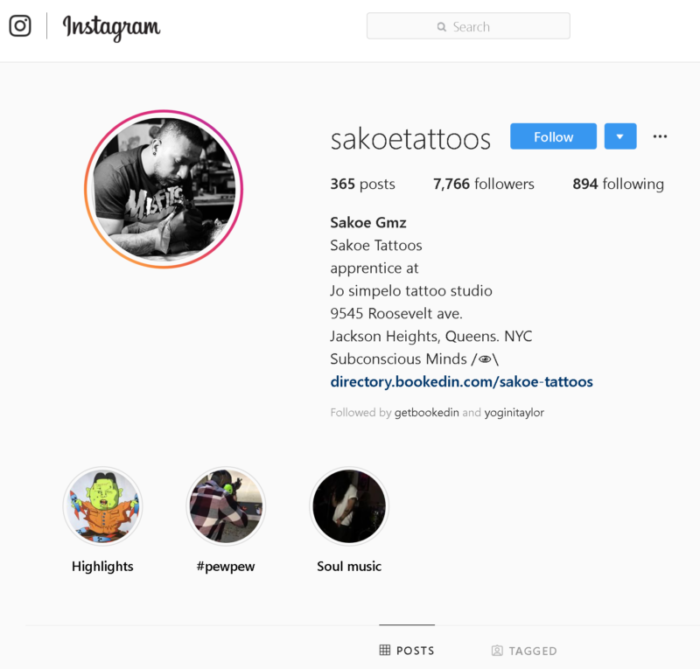 Available Calendars: This term can be changed to available “tattoo artists” to reflect your shop. Please make sure to check or uncheck your calendars based on the service. 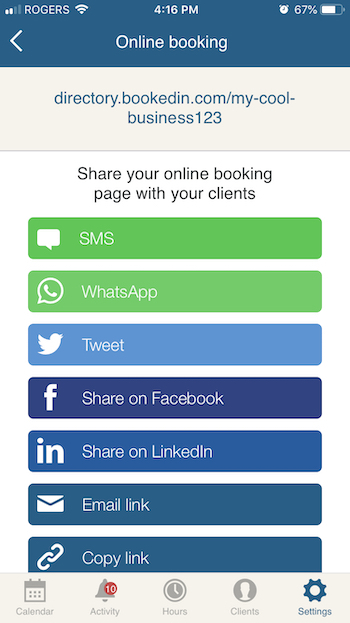 Share your online booking link and invite your clients to book online. You can share via Facebook, Twitter, WhatsApp, Text Message LinkedIn, email, or copy your link and paste it anywhere in your marketing. 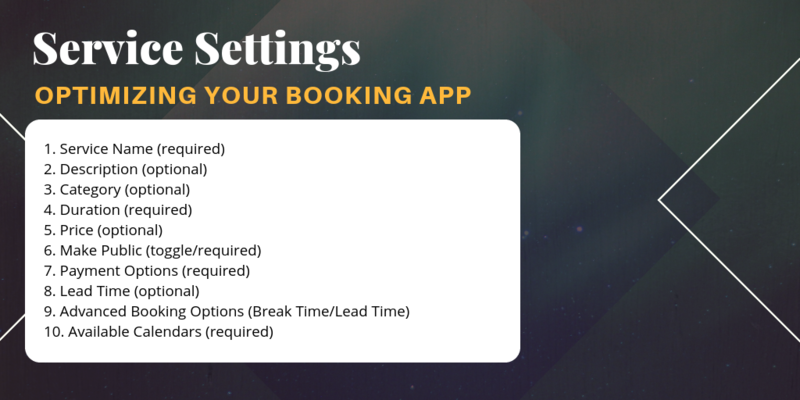 How are you feeling after going through the steps for setting up your services with BookedIN’s scheduling app? Let us know in the comments if you have any questions that we can help you with. If you don’t have online booking set up yet and you’re wondering how to get in on the action, you’re in luck. You can get started for free today. 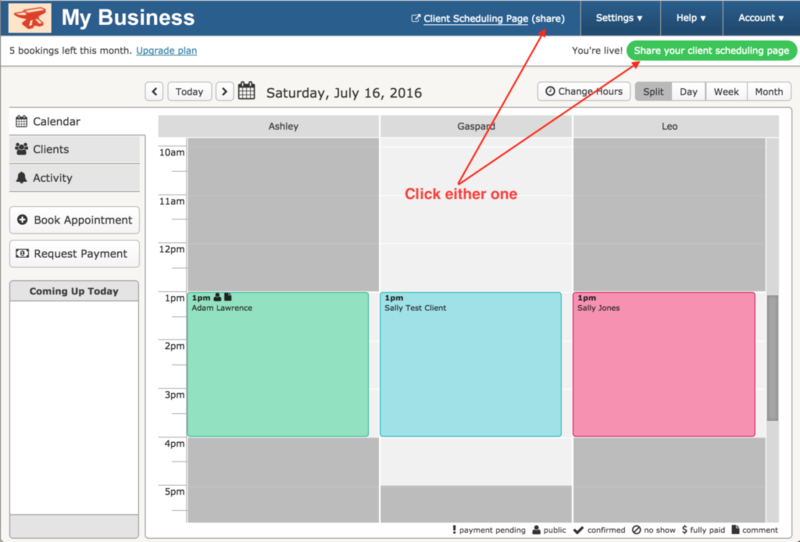 BookedIN’s online appointment scheduling software will help you save time, reduce stress, and get control of your booking chaos.